Charming Arcadian scene with a mountainous background, a Roman aquaduct in the mid-ground. In the foreground, from behind a tree, two satyrs eye a diaphanously draped nymph, possibly representing the story of Pan & Syrinx. 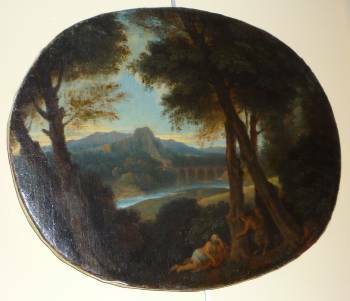 The reverse of the canvas inscribed "Poussin" in an 18th century style. © 2006 Gregory Connor Antiques Ltd.